Lately there was a lot of buzz about windows 7 phone. Some even have thought it to be a iPhone killer . Lets see what it is that makes it deferent from it predecessors. Windows Phone 7 is a mobile operating system developed by Microsoft, and is the successor to their Windows Mobile platform. It launched in Europe and Australasia on October 21, 2010, and is due to launch in the US on November 8, 2010, with Asia to follow in 2011. 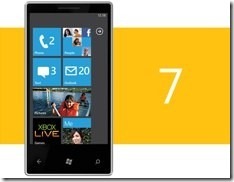 With WP7, Microsoft offers a new user interface, integrates the operating system with other services, and plans to strictly control the hardware it runs on. Windows Phone features a new user interface, based upon Microsoft’s Windows Phone 7 design system, codenamed Metro.The home screen, called the "Start screen", is made up of "Tiles". Tiles are links to applications, features, functions and individual items (such as contacts, web pages, applications or media items). Users can add, rearrange, or remove Tiles. Tiles are dynamic and update in real time – for example, the tile for an email account would display the number of unread messages or a Tile could display a live update of the weather. 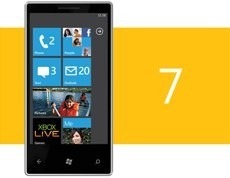 Windows Phone 7 will use multi-touch technology. The default Windows Phone 7 user interface has a dark theme that prolongs battery life on OLED screens as fully black pixels don’t emit light. Users input text by using an on-screen virtual keyboard, which has a dedicated key for inserting emoticons. Spell checking and word prediction are supported, and users may change a word after it has been typed by tapping the word; similar words that may have been the word the user was trying to type will then be suggested as alternatives. Phone manufacturers may also choose to include a hardware keyboard for the purpose of text input. Windows Phone 7 features a version of Internet Explorer Mobile with a rendering engine that is "halfway between IE7 and IE8. Internet Explorer on Windows Phone 7 allows the user to maintain a list of favorite web pages and show a tile linking to a web page on the Start screen. The browser supports up to 6 tabs, which can all load in parallel. Other features include multi-touch gestures, a streamlined UI, smooth zoom in/out animations, the ability to save pictures that are on web pages, share web pages via email, and support for inline search which allows the user to search for a word or phrase in a web page by typing it.